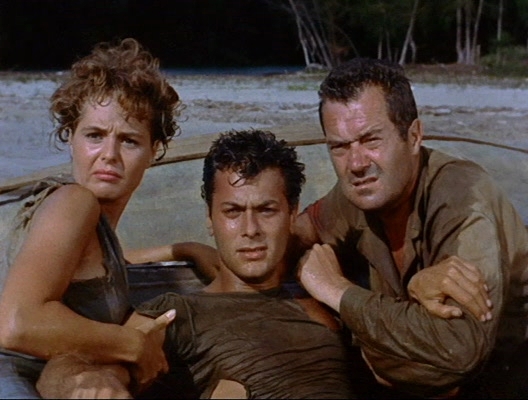 BEACHHEAD —-speaking of hottie French colonial planter’s daughters threatened by the Japanese, here it’s up to Tony Curtis and Frank Lovejoy to argue over who gets Mary Murphy after they discover where the mine-fields are laid on Bougainville. Deep breath. Nice color location lensing on the Hawaiian island of Kauai is the main ingredient at work in this silly 1954 matinée, directed by Stuart Heisler. Small patrol, jungle sneaking, bitter rivalry, climaxed by one of the most astoundingly dumb stunts in pretend-hero annals. Tony throws a grenade at a slick of oil, which ignites and blows up a Japanese destroyer. Yes, scouts, an entire ship with one grenade! Inexpensively made for $450,000, the goofoff paid back $4,000,000, 83rd b.o. posiiton that year, and gave Curtis, 28, on view in four pictures that year, another leg up on his rise to the big-time. With Eduard Franz, Skip Homeier and John Doucette. 90 minutes of doodle which lured patrons with the ad blurb “An Action-Hungry Marine….An Untamed Captive Beauty…Tangling in the heat of the jungle! ” It’s kind of a movie given that captive beauties are ‘untamed’.